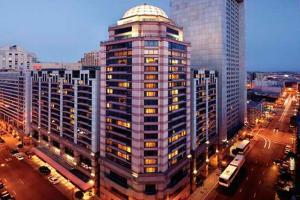 The Hilton Union Square offers a world of luxury in the heart of the city. Bordering Union Square, the Hilton Union Square is within walking distance of Chinatown, Nob Hill, the historic Cable Car, shopping, dining and much more. Located just off Union Square and the Cable Cars in the heart of the San Francisco's restaurant, theater, and shopping districts. Hilton San Francisco contributes to the city's reputation as a culinary mecca with a fine selection of restaurants and bars: Cityscape, The Café, Intermezzo, Lobby Bar, and Kiku of Tokyo. For the vacation traveler attracted to famous neighborhoods such as Chinatown and North Beach, or world class museums including The Asian Art Museum or Museum of Modern Art collections, you will be centrally located near most San Francisco bay area attractions. Take in a game at SBC or 3Com parks, stroll across the Golden Gate Bridge or tour Alcatraz.